Jamie Foxx sprang into action to help rescue a man from a burning car – and it was no Hollywood plot. The Oscar-winning actor and another good Samaritan rushed to help a driver, who rolled his pickup truck into a drainage ditch in Newbury Park, about 45 miles northwest of downtown Los Angeles, according to the California Highway Patrol and the actor's publicist. Officers say the driver, 32-year-old Brett Kyle, was drunk and speeding about 8:30 p.m. Monday when he careened off the road and into a ditch, striking a drainage pipe and concrete that caused the 2007 Toyota Tacoma to roll over multiple times and burst into flames. Foxx, who won a Grammy for his 2009 hit "Blame It (On the Alcohol)," and another witness, who has not been identified, ran to the burning wreckage, broke a window and cut the seat belt to pull Kyle from the truck, the CHP said. 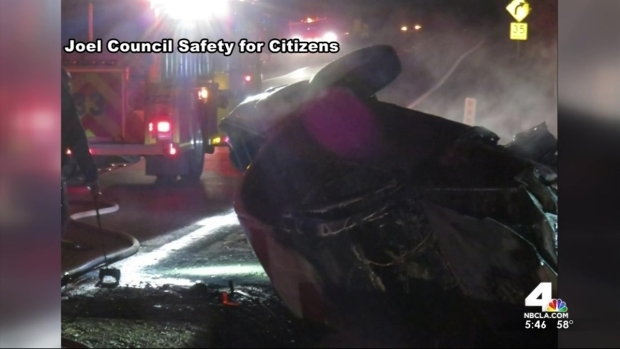 Actor Jamie Foxx is credited with saving a man's life after pulling him from a burning car wreck. Gordon Tokumatsu reports for the NBC4 News at 5 and 6 p.m. on Jan. 19, 2016. "Just got off the phone with my dad... Absolutely wild. That man really did have angels watching him. Definitely a life or death situation," tweeted Foxx's daughter, Corinne Foxx. Foxx himself was modest about the ordeal. "I don't look at it as heroic," he told reporters gathered outside his home Tuesday. 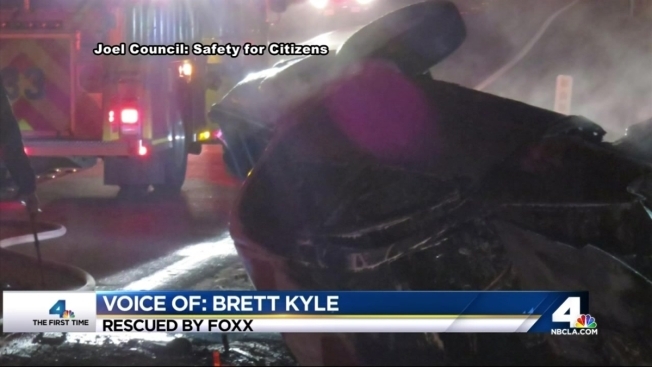 Kyle suffered major injuries in the crash, officers said. First responders took him to Los Robles Hospital and Medical Center in Thousand Oaks, where he was admitted in the intensive care unit. Speaking from the hospital, Kyle told NBC4 he remembered heat from the flames and being pulled from the truck, but did not know who his rescuers were. "They cut me out of the seatbelt," he said. "I didn't know who it was." He choked up and said he was grateful that Foxx and the good Samaritan risked their lives to save his. Kyle said his injuries included third-degree burns to a small area on his body and a broken collarbone. He said he feels better and has been taken off a machine that helped him breathe, but remains in intensive care. Kyle was arrested on suspicion of DUI. He didn't comment about the charge.